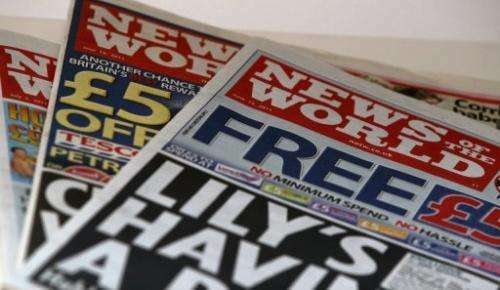 This file photo shows copies of the now defunct Rupert Murdoch-owned News of the World tabloid, pictured in London, on July 7, 2011. The government has insisted that bloggers and posts on social media would not be caught by a new system of press regulation, but campaigners warned the new rules could be open to interpretation. The British government has insisted that bloggers and posts on social media would not be caught by a new system of press regulation, but campaigners warned the new rules could be open to interpretation. Britain's newspapers are urgently considering whether to sign up to the new system agreed by political leaders on Monday in the wake of a phone-hacking scandal at the now defunct Rupert Murdoch-owned News of the World tabloid. The new watchdog, underpinned by law, would have the power to issue harsh sanctions on misbehaving publications, including fines of up to 1 million pounds ($1.5 million, 1.2 million euros). While the Leveson Inquiry into press standards resulting from the hacking scandal did not cover online publishing, the new royal charter hammered out by political leaders specifically covers "news-related" websites too, sparking uncertainty. In recent years, the authorities have taken a growing interest in prosecuting people for comments made on the Internet. Meanwhile newspapers have railed that details of court rulings preventing them from publishing stories about celebrities have been openly circulated online, effectively making a mockery of the rulings. Though the Department for Culture, Media and Sport stressed that small-scale bloggers and comments on Twitter and Facebook would not be subject to the new royal charter regulating publishers, campaigners feared that the new system could still be ambiguous. "It won't affect bloggers," a DCMS spokesman told AFP. "What Leveson was talking about was newspapers—national and local—and newspaper-type websites. It's not people who are writing a blog." To be considered a news publisher under the charter, outlets must meet each of three tests. 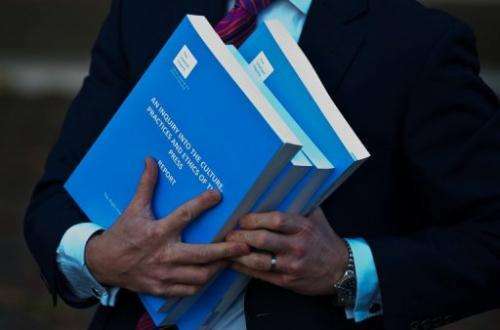 A member of the press holds copies of the Leveson Inquiry into press standards after its publication following a major inquiry set up in the wake of the News Of The World phone-hacking scandal, in London, on November 29, 2012. The government has insisted that bloggers and posts on social media would not be caught by a new system of press regulation. They must be "publishing in the course of business"; publish news-related material written by a range of authors; and be subject to editorial control. National and local papers and their online editions fall under the remit, as do lifestyle magazines and "online-only edited 'press-like' content providers", such as the Huffington Post, said the DCMS. Those outside the boundary include "news aggregators and social networking sites", small special interest publishers, student and not-for-profit community newspapers, scientific journals and broadcasters' websites, such as the BBC's online arm. "Ultimately, it is a matter for the court to decide on the definition of a relevant publisher based on assessment of the facts, in accordance with the three interlocking tests (course of business, range of authors and editorial control)," DCMS said. "But if material isn't subject to editorial control it shouldn't be caught." The new watchdog will also be able to force publications to issue upfront apologies for inaccurate or intrusive stories, as well as offering a free arbitration system for victims. Political party leaders say it will rein in the kind of misdeeds exposed by the News of the World tabloid without curbing press freedom. Despite the reassurances, some are worried about the knock-on effects the new plans could have on Internet news and comment. Kirsty Hughes, chief executive of the Index on Censorship freedom of expression campaign body, said Tuesday that despite the politicians' claims, the "loose definition" of a publisher would "undoubtedly have a chilling effect on everyday people's web use". "Bloggers could find themselves subject to exemplary damages in court... This mess of legislation has been thrown together with alarming haste: there's little doubt we'll repent for a while to come." Paul Staines, who runs the well-respected Guido Fawkes blog about British politics, argued that the new plans were unworkable. "I don't see how they can regulate the worldwide web when the servers are based in other countries," he told BBC radio. "My servers are in California. Are they going to send the royal navy gunboats to North Beach, California to pound the servers? "They could come after me individually but I think they would have little chance of success. "The prime minister's spokeswoman said I wouldn't be regulated. Everybody else, lawyers, say that I will be regulated. "How can you regulate somebody who doesn't want to be regulated and doesn't have bricks and mortar in the UK?" In reference to the deal struck by politicians in the early hours, he added: "When you draft legislation at two in the morning, you are going to get shambolic results."